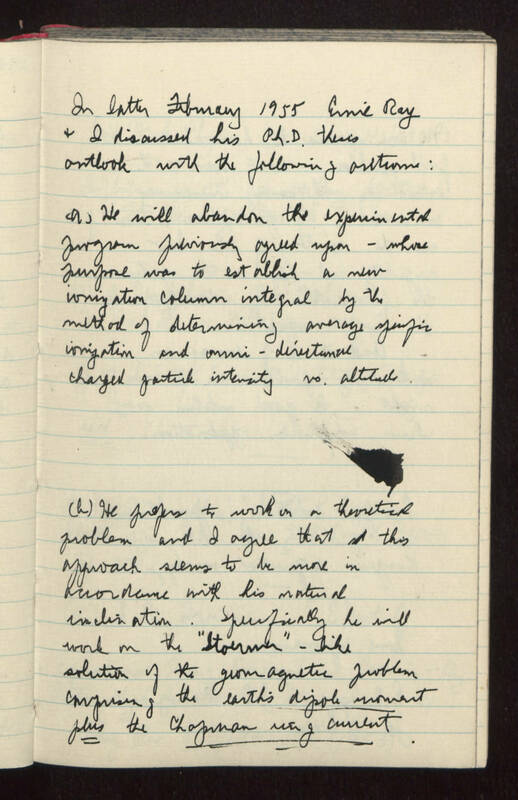 In latter February 1955 Ernie Ray and I discussed his Ph.D. thesis outlook with the following outcome: (a) He will abandon the experimental program previously agreed upon -- whose purpose was to establish a new ionization column integral by the method of determining average specific ionization and omni-directional charged particle intensity versus altitude. (b) He prefers to work on a theoretical problem and I agree that this approach seems to be more in accordance with his natural inclination. Specifically he will work on the "Stoermer"-like solution of the geomagnetic problem comprising the earth's dipole moment plus the Chapman ring current.